What to do with ashes? Turn them into a diamond. What to do with ashes? Turn them into a diamond! When a loved one dies, there are two options for lovingly dealing with their body: burial and cremation. The process of cremation leaves behind ashes that can then be used in a tribute to the deceased loved one. Read on to find out what to do with cremated ashes to honor your loved one. Cremation is the process of burning a person’s body through the use of extreme heat (typically greater than 1,400 degrees Fahrenheit). The resulting cremated ashes are then returned to the family. A small amount can be given to the deceased person’s family members, and they can decide what to do with the ashes of their loved one individually. According to Slate, part of the growing popularity of cremation is the fact that it gives families more choices when deciding how to honor their deceased loved one. While the ashes are often placed in a beautiful urn and then buried or kept in a place of honor, not everyone prefers these options. They want to do something more tangible to honor the life of their loved one. There are many options when deciding what to do with a loved one’s cremated remains. Fortunately, cremated ashes offer many options to help remember the deceased loved one close to your heart. One of the most well-known and most common things people do is scattering. Cremation ashes can be scattered almost anywhere. They can also be scattered all at once or in several different places. Angels Flight is a company that turns cremated ashes into a beautiful fireworks display for grieving families to celebrate the deceased’s life. Tré Miller Rodríguez from Modern Loss, writes that one woman scattered her husband’s ashes around the globe. Usually, they are spread in a place (or places) that is particularly beautiful or significant to the deceased person. For example, a mountain climber’s cremated remains might be scattered on one of his or her favorite mountains, while a widower might scatter his wife’s ashes at the site of their honeymoon. Some people choose to take their loved one’s ashes in to an eternal ascent, which involves sending off ashes into a helium-filled balloon. The most important thing to remember is to send your loved one off in a place you’ll know they will love. One can also choose to keep the ashes in an urn. Thanks to the popularity of this choice, and the necessity of using an urn if the ashes are to be buried, there are many types of cremation urns available. Often, the urn is kept in a place of honor in the home. At other times, both the urn and the ashes it contains, are buried. There are even biodegradable urns available. Another popular way to pay tribute to your loved one and their cremated remains and a bios urn. It takes the ashes and converts them into a tree. This is a wonderful way for them to live on forever in a different form of life. It is a return to life through the use of nature. Some on the other hand, may wish to keep their loved one close in a more tangible way. These people choose to turn their loved one’s cremains into a beautiful memorial tattoo. For example, some people have some of their loved one’s ashes tattooed on their bodies as a permanent reminder of the place the loved one held in their life. This procedure requires the cremains to be ground finely enough to mix with the tattoo ink, and it requires the help of a tattoo artist who has experience in the technique of doing memorial tattoos. There are companies whose focus is on creating beautiful works of art using the cremains of deceased loved ones. If your loved one was a music lover, you can turn their ashes into a playable vinyl record. Another increasingly popular use of cremains is to use them in jewelry. For example, some people choose to have a few of the ashes enclosed in a necklace or pendant. All of these options concerning what to do with cremains serve a valuable purpose in allowing people to memorialize their deceased loved ones. One of the best ways to both keep a loved one’s memory close and to tangibly capture the beauty they brought to one’s life, is to arrange for the creation of a memorial diamond from Heart In Diamond. Heart In Diamond offers a way to take memorial jewelry to the next level by turning ashes into stunning diamonds. The 70-120 day process extracts the carbon from the cremated ashes, adds it to a mixture, and subjects it to a high temperature, high pressure environment like the one that creates diamonds in the earth. The result is a beautiful diamond that reflects the vibrancy, beauty and memory of the loved one. The diamonds can then be set into any type of jewelry and worn as an eye-catching and permanent tribute to the deceased person. Because each person is unique, every diamond created by Heart In Diamond is unique as well. 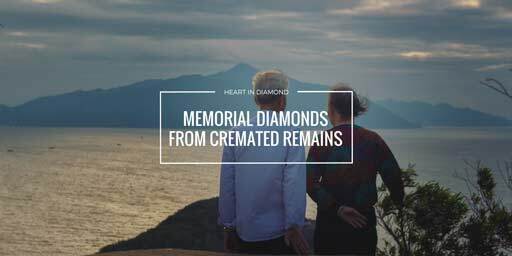 When it comes to memorializing a loved one by using their cremains in a tangible way, it is hard to beat the diamonds created by Heart In Diamond. Their beauty makes them easy to wear at any time and in any place. The range of choices available makes it easy to create a diamond that accurately reflects the person being memorialized. Their tangibility makes them a concrete tribute.